If you are like many people out there, you love tomatoes…tomatoes in a fresh cucumber salad, tomatoes on your veggie burger, tomatoes on the grill, tomato slices served with your over easy eggs and so much more! How would you like your food prep to be fast and more enjoyable when it comes to all of your tomato needs? Tomato, tomoto, right? Well…not so much. Some things just aren’t created equal. If you want a 1-2-3 punch for your tomato prep, get ready to rumble! The 3 in 1 Tomato Tool from Houseware Warehouse is an all-in-one prep tomato prep tool that can make your life a whole lot easier. With the unique and versatile 3 in 1 Tomato Tool, you can core, slice, wedge and de-seed easily and to your heart’s content. 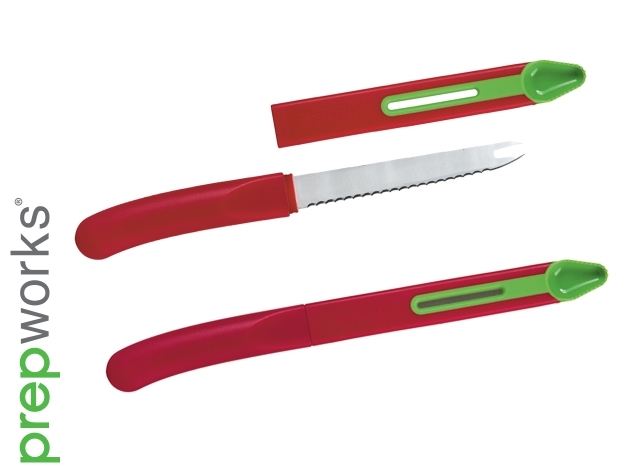 Its serrated blade slices smoothly through ripe tomatoes. Its tomato fork tip serves and helps to effortlessly transfer individual slices. Finally, its knife cover doubles as a coring and de-seeding tool. And that’s not all. With this baby, clean-up is a breeze because the 3 in 1 Tomato Tool, available at Houseware Warehouse, is dishwasher safe. So, give our catalog a visit at housewarewarehouse.net, keep your eyes peeled for the 3 in 1 Tomato Tool and get right to the core of all your tomato matters!